One of the places I go often when it comes to cosmetics, skincare, fragrances and anything else when it comes to beauty is my local Shoppers Drug Mart. By now the reps know me pretty well and I'm okay with that, lol. They always have everything I need and I love that if I have questions or concerns about a product a rep is always there to help me out. So you can imagine my excitement when I heard about Murale By Shoppers. The actual stores have been around for about five years, but their e-commerce online shop have been open for about a year. I was excited to know more about it. Murale was designed for a one stop beauty destination that will have each of us having a shopping experience like no other. They carry makeup, skincare, fragrances, accessories and more from all the big brands. With Murale you'll be able to shop 24/7. With online shopping becoming bigger and more popular with women everywhere, Murale opening an online shop was perfect. 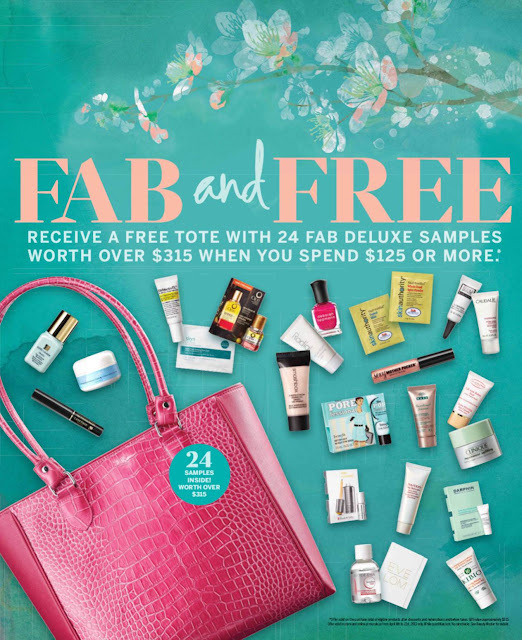 Not only does this allow us to shop online for all the great cosmetic brands we love, but we also get a chance to earn Shoppers Optimum points as well, which I think is fantastic! With every purchase online, customers are qualified to receive five free samples as well. Another thing I love about Murale is that they often run great online exclusive offers which includes; contests, exclusive Optimum promos, Free Shipping and so much more. 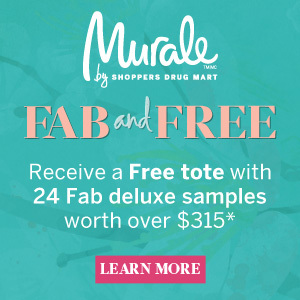 Right now you can check out the latest Fab & Free deal from Murale from now until April 21st only you can Receive a Free tote with 24 Fab deluxe samples worth over $315 when you spend $125 or more in store or online. They're also offering a 20k optimum points coupon when you spend $125 or more in store. You'll receive the Fab & Free Tote, which will include your coupon for 20k optimum points which you can validate during your next purchase. This offer is valid in-store from April 22 to May19, 2013 only. So head on over to Murale and check them out online. The site is very easy to navigate around and has lots of informative information on each beauty product they have, they also have products for men too! Disclosure: All opinions are my own. The deals mentioned above are apart of a sponsored post through our ad network, SheBlogsMedia, for Murale.